WASHINGTON — OK, Katie Smith, no pressure or anything, but get a load of the basketball big shots name-checked by Washington Mystics general manager Angela Taylor at Tuesday's news conference announcing your signing. For starters, Taylor called Smith "the LeBron James of this free-agency process." "She is the Wilt Chamberlain or the Michael Jordan of the WNBA," Taylor said, adding: "She is truly one of the best players to ever have played this game." That is a lot to live up to, certainly. Still, Smith does bring some serious credentials to a building Mystics team that went 16-18 last season to reach the playoffs for the first time since 2006. 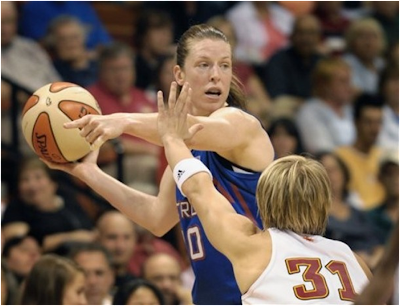 The 5-foot-11 guard helped the Detroit Shock win two WNBA championships and was the MVP of the 2008 finals. She also was a member of three Olympic champion U.S. basketball teams -- at the 2000, 2004 and 2008 Summer Games. "I'm going to be happy to have her on a team and not have to play and coach against her," Mystics coach Julie Plank said. The 35-year-old Smith missed the last seven games of last season and the playoffs with Detroit because of a herniated disc in her back that left her numb. But she pronounced herself fit Tuesday. "The timing of the injury allowed me to have a whole full offseason to do what I needed to do and not rush back," Smith said. "Now it's just getting on the floor and getting the rust off and getting the timing back." She has averaged 15.7 points, 3.1 rebounds and 2.8 assists for her WNBA career across 11 seasons with Minnesota and Detroit. Her 5,446 points rank behind only Lisa Leslie and Tina Thompson in league history. With her time in the ABL, where she also was a league champion, Smith's point total is a record 6,879. The Mystics are hoping Smith can help continue the franchise's improvement, bringing a sense of been-there, done-that to last season's youngest playoff roster. "She's everything that I'm striving to be. She's been an Olympian. She's won WNBA championships. She's done everything there is possibly to do," Mystics leading scorer Alana Beard said. "Her mental toughness, her leadership, her experience is definitely what we need to take that next step and win a championship."